To assist employees in finding housing for the winter season, Stevens Pass offers local area homeowners incentives to rent to Stevens Pass employees through the “Tenants 4 Turns” program. Local landlords advertise their rental at Stevens and they maintain a list of rentals, and make it available to any hired employee. Once they receive a signed rental agreement the landlord receives a pass or ticket package. Do you have a house or room for rent in the area? Would you like to ski or ride this winter at Stevens Pass? Agree to list your rental through the Tenants 4 Turns program and rent to a Stevens Pass employee this winter and you may be eligible for 10 lift tickets good for the 2012-2013 winter season or a $100 season pass! 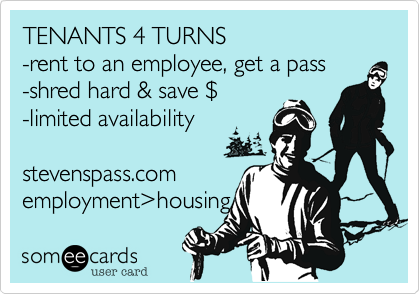 To request more information on the Tenants 4 Turns program guidelines and eligibility requirements, email humanresources@stevenspass.com. Tenants 4 Turns: Rent a Room, Get a Stevens Pass season pass! This is a really cool option for Leavenworth area residents. Whether you’re a home-owner, a renter needing a roommate or a landlord…there’s a way to earn a free* season pass from Stevens Pass Ski Resort. The “Tenants 4 Turns” program was created 3 years ago in an effort to secure local housing for their employees. The employee housing at the resort fills up quickly and employees turn to Leavenworth for one of the best, shorter-commute options. If you are able to rent a room, apartment or home to a Stevens Pass employee you could receive 10 free lift tickets or a season pass* (*must pay a $50 recording fee). The limit is one per address. For more information email Justin Tremlin at justin.tremlin@stevenspass.com. If you’d like to get the scoop in person, attend the Tenants 4 Turns Q & A on Tuesday, Oct. 11th from 6 to 8 p.m. at Icicle Brewing Company (upstairs). Justin will be there to answer questions and sign up folks for the program.